CPD – ‘Continuous Professional Development’ is the systematic maintenance, improvement and broadening of your knowledge and skills and the development of personal qualities necessary for the execution of professional duties throughout your working life. The process enables you to stay ahead of your profession. 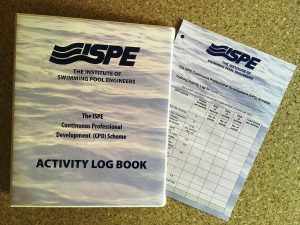 We all have a duty to keep up-to-date with techniques, developments, and requirements in all areas of the swimming pool profession. In order to carry out our jobs to the best of our ability, some level of expertise is necessary and it is important that we, as individuals, continue to develop such skills and techniques. The ISPE CPD scheme is a convenient, formalised way to achieve this, and keeping a written record of your training or learning activities will help to raise levels of expertise and performance. Carry out a SWOT analysis. This should be an honest and frank assessment of your personal position. Strengths. What are your personal positive attributes and your present position? Weaknesses. What are the negative aspects about you and your present position? Opportunities. What aspects relating to the present or foreseeable future can be used to your advantage? Threats. What aspects relating to the present position or foreseeable future may operate to your disadvantage? Which is the best way to get there? How do I ensure that I achieve my objectives? Determine the skill you need. professional development of others e.g. colleagues. At any stage, it helps to determine competencies you will need; for example, both technical and interpersonal skills can help raise overall performance. Keep records of relevant activities and learning. Stay focused on areas you need to develop and record all activities on your personal record. This will enable you to review your position and see how you have progressed. Email a copy of your record in June each year to the ISPE Office (ross@ispe.co.uk) so your progress may be monitored. Evaluate and review your progress, regularly. This will give you an indication as to how you are meeting your original objectives and will enable adjustments to be made accordingly. CPD can take many forms. For example: Attending seminars, workshops or courses; taking part in meetings or discussions, reading or writing a technical article and, for those newer to the trade, progressing through the ISPE Home Study Course and completing the exams, for example. The most important factor is what has been gained, (the outcome) by you, as a result of that meeting, seminar or other activity. Participants should check the ISPE website and trade press regularly for announcements of ISPE and other industry-supported training sessions, but CPD points may be awarded or claimed by attending other non-industry training courses, such as fork lift truck driving or first aid, for example, in fact, anything that improves your knowledge. The important thing is to record your training activities and keep attendance certificates etc. in the folder provided, together with you record sheet. The ISPE CPD scheme is intended to encourage personal development to meet the needs of the individual. Individuals, therefore, should take responsibility for identifying their own needs and continuously developing themselves. CPD is a personal issue and it is not possible to state the number of hours that it will take to meet the individual needs, the targets listed are guides only. Enables identification of weaknesses in performance and provides the ability to instigate remedies. By keeping aware of developments and current issues, you will be able to respond to changes that may occur in your organisation or company and to display high competence in your field of operations. CPD can have the effect of raising the level of your own performance and of your staff (if applicable) and this usually leads to increased motivation. By taking responsibility for your own career, and by recording achievements, you will be able to show your employer or prospective employer, real evidence of your commitment to learning and development. Register now by filling in the CPD Registration Form and it back to emailing ross@ispe. co.uk and we’ll send you your FREE ISPE CPD folder and Record Sheet.